Physical therapy is an important part of proper limb amputation recovery. 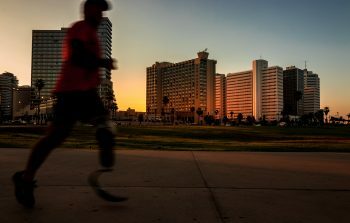 Whether or not a patient opts for a prosthesis, he’ll need to keep the rest of his body in active shape to stay healthy. When an amputee recovers from surgery, one of the components of the recovery process is physical therapy, starting right away. At the very beginning, the site where the amputation took place, or the wound, will necessarily take some time to heal. At this time, physical therapy will obviously have to be minimal, because the patient will still be recovering from surgery, and because overstressing the area will delay healing, causing setbacks. However, as soon as the patient feels initially recuperated from surgery, the hospital will begin some form of physical therapy to keep the patient in motion. The patient will generally transfer to a short term rehabilitation facility within a few days of surgery; the hospital is for the procedure, but the real work of recuperation and strengthening is in the rehab facility. As the wound begins its healing process and the patient has sufficiently recovered from the amputation, the rehab staff will introduce a more rigorous physical therapy regimen, and they will continue to increase it as the patient grows stronger and can handle more physically. If and when the patient receives her prosthetic, the physical therapy team will develop a new program for him to learn how to use his body in tandem with the new limb. He’ll continue with it until he’s ready to be released from the rehab, and then he’ll start a new outpatient treatment plan. Part of the physical therapy treatment is simply moving the limbs. The therapist is trained in using the right exercises to give the limbs motion at the level the patient can handle. The therapist herself will do much of this work. Once the patient is ready, the therapist will begin to direct him to do the exercises himself. Most sessions are short, between thirty and sixty minutes. Someone who has an amputation will not be using the surrounding limbs for a certain period of time. It’s important to keep these other body parts in function during this time so that they don’t lose their capabilities. Without physical therapy, the body is likely to lose some level of functioning that may not be able to be recovered later on. It also keep circulation flowing, without which the residual and surrounding limbs could become more problematic, with the potential for loss of use. The residual limb needs to be massaged and given motion exercises so that it doesn’t develop a contracture. A contracture is when the skin, tissue or joints of one area affects the skin, tissue or joints of a different area. For example, if an arm was amputated below the elbow, a contracture would inhibit the proper movement of the elbow joint. Preventing a contracture is much easier than correcting it later – an ounce of prevention is worth a pound of cure. Lastly, keeping the surrounding area in good shape while waiting for a prosthesis will make it much eaiser to gain quick success with the prosthetic once it arrives. An important facet to keep in mind is that physical therapists are trained in different methods, and not all of them are geared toward each type of debility. It’s essential to find a physical therapist who’s experienced in dealing with amputations and wound care. At Sinai Post Acute Care Rehabilitation Center, we have physicians and physical therapists who are experts in amputation rehab and wound care. Come see our large and modern facility in the heart of Newark, New Jersey, serving the surrounding communities with high quality nursing and rehab services.